Jidokwan, as meaning of the “way of wisdom”, has developed through the root of Chosun Yun Moo Kwan. Jidokwan, especially took a main role for the Kwan unity act, the new executive committee drove the act positively. For myself, for the Kwan, for the country, based on these three words, Jidokwan was founded in March 3rd of 1946. The Jidokwan was first titled as Cho Sun Yun Moo Kwan Kong Soo Do Bu. The Cho Sun Yun Moo Kwan first founded by Chun, Sang Sup, the first grandmaster of Jidokwan. Master Chun, Sang Sup first started his martial arts career in Judo during his high school years, then he attended Dong Yang Chuck Sik (Takushoku) College in Japan, where he mastered Karate. After graduating from college, Chun, Sang Sup returned to Korea, and started to teach Taekwondo to black belt Judo trainees in the Yun Moo Kwan, which was located in Soo Song Dong, Seoul at the time. Lee, Kyung Suk was the grand master of the Yun Moo Kwan during that time and Cho Sun Yun Moo Kwan was a Judo dojang. After the surrender of Japan in world war II in August 15th, 1945, Cho Sun Yun Moo Kwan moved there location from the Soo Song Dong to So Gong Dong, where the Japanese Gang Duk Kwan used to be located, and officially announced the opening of the Cho Sun Yun Moo Kwan as branch of the Korea Taekwondo. At that time, Taekwondo was called Kwon Bop Boo. The first trainees of the new Cho Sun Yun Moo Kwan were, Chun, Ill Sup, brother of Master Chun, Sang Sup; Pae, Young Ki; Kim, Bok Nam; Lee, Chong Woo; Pak, Hyun Jong; Lee, Byung Lo; Chung, Jin Dong; Kim, Chun Sun, they later became members of the Jidokwan. Chun, Ill Sup first popularized the Taekwondo to the state of north Jun-La (Cholla buk do), Bae, Young Ki served 3rd Grandmaster term for the Jidokwan, and Lee, Chong Woo served 2nd and 4th grandmaster terms and they became the main leaders of the Jidokwan. Yet, Park, Hyun Jong gained the strength of Jidokwan from the reign of the Pusan and Lee, Kyo Yun from Han Moo Kwan joined the Jidokwan and founded the Han Kuk Chae Yuk Dojang (Seoul) and acted as master while he was working for the police communications department. Great Grandmaster Yoon, Byung In was a best friend of Chun, Sang Sup. 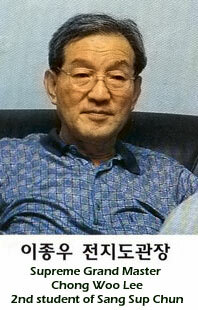 He was a hired Sabum at Chosun Yun Moo Kwan in 1948. While studying in Japan, Master Yoon became a student of Kanken Toyama Sensei. After teaching for Master Chun for 1 years, he opened the YMCA Kwon Bop Bu (Chang Moo Kwan) with Lee, Nam Suk. He disapeared during the Korean War. However, Pyong Soo Kim states that he made contact with Master Yoon by writting letters to him in North Korea. Jidokwan and Chang Moo Kwan are considered brother Kwans as Master Yoon and Master Chun were often called brothers due to training together so much. 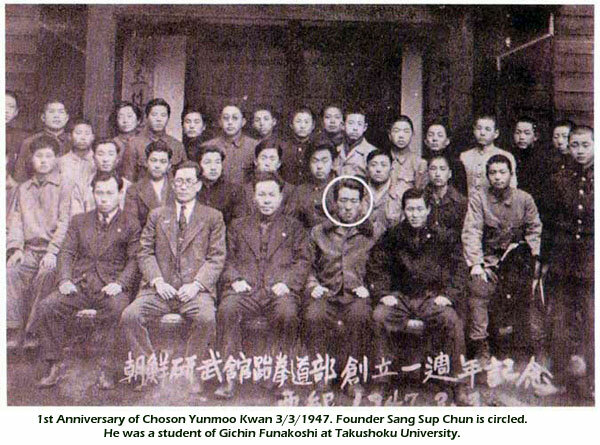 Yoon, Byung In, the founder of Chang Moo Kwan, also worked as master for one year in the Cho Sun Yun Moo Kwan in 1947. Later he went to the YMCA and then founded the Chang Moo Kwan. Great Grandmaster Yon, Kwai Byeong trained in Chuan Fa in Manchuria. Also trained and was certified as a Shihan (Sabum) under Kanken Toyama while studying in Japan. Became 2nd hired Sabum to work for Master Chun. After Master Chun disapeared in Korean War, the original students of Master Chun voted Master Yon as Jidokwan 1st President. However, in the mid 1960’s, Master Yon opposed Kwan unity and was voted out of Jidokwan. Chong Woo Lee became the 2nd Jidokwan President. With appointment of new master Yoon, Gae Byung, who was known as a great master among the Karate field, Cho Sun Yun Moo Kwan became very active. In June 25th 1950, the Korean War started and the Grandmaster Chun, Sang Sup, founder of Cho Sun Yun Moo Kwan, was abducted to North Korea. And during the evacuation period in Pusan, the Cho Sun Yun Moo Kwan changed their name to Jidokwan. Lee, Chong Woo first suggested the change of the Cho Sun Yun Moo Kwan’s title and with the agreement of Yoon, Gae Byung, Cho Sun Yun Moo Kwan became Jidokwan. “After the abduction of master Chun, Sang Sup during the Korean war, I have suggested to Yoon, Gwae Byung for the change of the title and with his agreement, I suggested the appointment of Yoon, Gwae Byung as the grand master”, said Lee, Chong Woo. Jidokwan became very active and gained their strength in 1953, when Jidokwan extended their organization on the Han Kuk Chae Yuk Dojang’s (Korea Sports Center) Taekwondo Department. During that period, once or twice a year, they thought self-defense and bone setting from special sessions. But Jidokwan started to have disruption over the Kwan unity act. During the development of the Korea Tae Soo Do Organization, Ki Hwang and his followers from Moo Duk Kwan and Yoon, Gwae Byung and his followers from the Jidokwan stands in opposition to the Kwan unity act. And that was the start of the disruption of Jidokwan. Lee, Chong Woo drove the Kwan unity act without Yoon, Gwae Byung and became 2nd Grandmaster of the Jidokwan with the support of the national committee. Kim, Chun Sun (council of Jidokwan), Cho, Yong Dae (president of Australia’s committee), Lee, Sang Chul (president of USTU), they are also alumni from Jidokwan. Jidokwan, along with Moo Duk Kwan, acting as the main role of modern Taekwondo in Korea. Especially Jidokwan’s unique and intensive training, one would have to defeat three straight competitors to have belt promotion, made the birth for the great athletics for this period. In the 1950s, 60’s and early 70’s, when the Kwan’s existed as martial arts, some black belts left their Kwans for various reasons. The main reason for most black belts to leave the Jidokwan was that this Kwan had a reputation for being the best sparring school, taking over 70% of the nationals sparring titles. These fighters where highly prized by the Kwan and the Korean Government. Some Black belts from this school who did not participate in sparring did not like this preferential treatment, so some joined other Kwans, or became independent. The most notable person to break away from Jidokwan, due to disagreement, was Kyo Yoon Lee who went on the found the Han Moo Kwan in August of 1954. Kyo Yoon Lee writes about this development in his English language book “Global Taekwondo”. Today, the Han Moo Kwan, like the other eight Kwans has millions of descendant practitioners world wide.